SHomes for sale in St. Paul do not hang around long. When property does hit the St. Paul real estate market, it is gone in a flash. Most homes are older, but there are a few newer ones as well. With the economy in its current state, new homes are not being built in most areas. There is space to grow in St. Paul so if you are looking for a great little community located in the country, let’s talk about finding your next home. 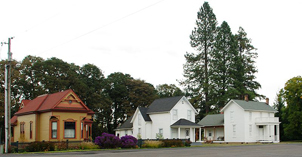 Take Hwy 219 out of Newberg and within minutes you have reached the quaint town of St. Paul, Oregon, located in Marion County. There is a bank and a gas station, the Rodeo Inn, and a coffee shop. The center of the town might be considered the St. Paul Catholic Church, which is a beautiful historical church – the oldest brick building in the Pacific Northwest and the first church in Oregon built with bricks dating back to 1846. The bricks were fired on site. It is a beautiful church, but ask a rodeo enthusiast about the center of town and they will tell you it is around the corner and up a few blocks in a white-washed deserted arena… This is the home of the St. Paul Rodeo. For a few days each July, this arena comes to life with bull riders, barrel racing, saddle broncs, team roping, steer wrestling and more. This event is not to be missed. The community is small with a grade school and combined middle/high school. The grade school has 135 children and the middle/high has 125 in total. This puts the teacher student ratio at 14.9 students to each teacher. St. Paul spends an average of $5,846 per student each year, the nation average is $5,678. I have not seen a school district spend this much per student before. 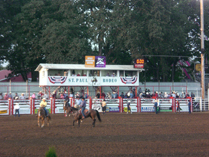 The Best of St. Paul – the St. Paul Rodeo! As an outsider, you might ask why anyone would go to the little town of St. Paul, a community with one gas station and a single coffee shop??…. let me just share the secret…(well, not sure if it is a “secret” as over 4,400 people have ‘liked’ it on Facebook and you can follow the rodeo on Twitter). The St. Paul Rodeo is ranked one of the top rodeos in the nation with prize monies close to $500,000 with over 1,000 competitors. Not bad for a town of only 400 residents. Here’s the deal…an influx of thousands of spectators descend on the small town every 4th of July weekend. 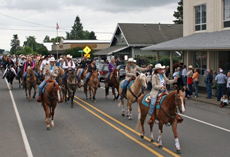 Hundreds of locals rally together to put the rodeo on, and do they put it on! 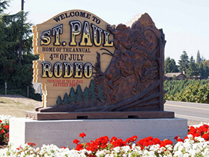 The first event happens in early June with a Youth Rodeo. There is a Hall of Fame BBQ, the official rodeo, a carnival, the Professional Bull Riders Tour, followed by the evening fireworks display. The local Jaycees host an evening dance with a live band – the Piedmont Boys. The fun goes on for 5 days…you may want to rent an RV and park it in one of the nearby parks. You just can’t leave town without experiencing the St. Paul Rodeo. All of it! Dust off your boots and get your cowboy hat out of the closet. Get down to the carnival, the Western Showcase, rodeo, fireworks and the Jaycee’s bull pen dance. You need to drink a lynchberg lemon aide, and enjoy some old fashioned fun. Roll on 4th of July!